In the fall of 2011, the familiar white, green, and blue Island Explorer buses moved to their permanent home with the completion of the first phase of the Acadia Gateway Center in Trenton. The project got its start in 2007, when Friends of Acadia purchased the 369-acre “Crippens Creek” property in Trenton and sold approximately 150 acres to the Maine Department of Transportation to carry forward the center’s construction. 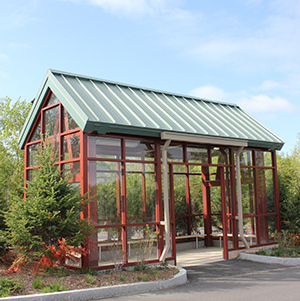 Phase one houses the bus maintenance facility, a propane fueling station, and administrative offices for Downeast Transportation, the nonprofit operator of the Island explorer and county-wide transit systems. The building, tucked back well out of sight from Route 3, received LEED gold certification for its design performance in relation to human and environmental health. The Acadia Gateway Center partnership includes: Friends of Acadia, Acadia National Park, the Maine Department of Transportation, Downeast Tranportation, the Town of Trenton, L.L.Bean, the Federal Transit Administration, and Maine’s Congressional delegation. Funding for phase one came from several federal and state sources, along with $50,000 from Friends of Acadia to complete the installation of phone lines, security systems, and business equipment. Future phases of the Acadia Gateway Center will include a regional transportation hub and a visitor welcome center. Parking spaces and an enclosed bus stop shelter are already in place. The welcome center is currently being designed while partners seek funding for construction. 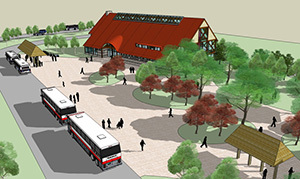 The current plan is for a two-story building with the outside appearance of a large Maine barn and inside, an open floor plan where visitors can find information from the National Park Service and area chambers, purchase park passes, browse historical and informational displays, and wait for Island Explorer buses. And what about the remaining 220 acres of land? FOA worked with a volunteer committee and the Town of Trenton to build a community trail behind the Gateway Center, leading to a little-seen wetland in Trenton’s undeveloped interior. The Trenton Trail was inaugurated in June 2013, and Friends of Acadia donated the entire parcel of land to the Town of Trenton in December 2013. If you live in Maine, contact your Congressional representatives and thank them for their support of the Acadia Gateway Center in Trenton, and all they do for Acadia National Park.